The software automatically load the NTFS drives present within a machine as you launch it. You can view the basic details of each drive like File system, Available size and Drive size. After that, select any one drive and the software quickly scans it to show you the complete details of the selected drive. After scanning the drive, software will load all the items present in it. Click on any specific folder and software will show you all the files in that specific folder. You can also preview the details of each file like Name, old name, created date, modified date and last access date. As you click on any specific file while previewing it, the software will show all the activities related to that file by date. It will show you the date on which file is created, renamed (Along with the older and newer names) or being deleted. Also, you can check status of file that is Read Only, Hidden and compressed. The software provides you an option to apply search filters to find any specific file or folder within the scanned results. You can select the items on which the operation has to be performed like all, created, renamed, deleted and set a specific date range between "From" and "To" dates. It is possible to type any search term or phrase and software will list all the items having the exact matched term. After applying all the search filters as you click on search command, the software will show you the complete Logs. This log file includes the details like: File name, older name, and folder path, creation date with time, modification date with time and last access date with time. Once the searching finishes, the generated log status report can be exported in CSV format. The software allows you to save the data in your location machine anywhere. This will help you to use it in future for reference. How Much Time it will take to Scan a Drive ? The software is programmed to perform swift file scanning, still the scanning process time consumption will entirely depend upon the size of your system drive. Do You offer Technical Support for the Software ? Yes, we offer 24 x 7 hours free online help for all the products we are having. How Can I Use the NTFS Log Analyzer ? The software is user-friendly and available for free. You only need to install it on Windows Machine having NT file system and software will scan the system partition. We often get the machines where system log analysis is required for the evidence recovery. 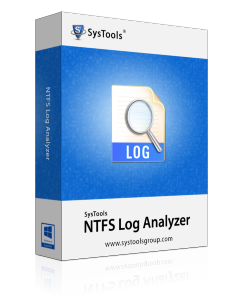 This NTFS system analyzer helped us to quickly view the complete system log details and make analysis in better way. I usually need to track my systems atcivity and NTFS log analyzer is what makes the task even easier for me. In one go, i can view all the activity of any machine in any date range.